This entry was posted in Dining and tagged place settings, setting a table. Bookmark the permalink. Yes, but can you fold a napkin into the shape of a swan? Waitressing sure pays off too. We did napkins that looked a bit like a hat. Sadly, I never learned to do a swan. Perhaps you can teach me someday. 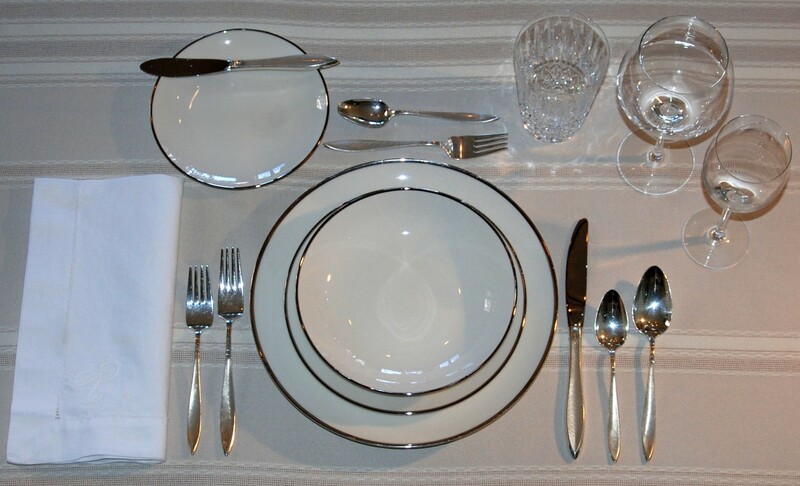 Would there exist a logical reason for the bread plate being placed to the left of the place setting (a.k.a. cover)? is it to somewhat ‘equalize’ the guest operations at the place setting i.e. operate with the bread and butter to the left and the wines/water to the right or is it just more ergonomic for a right hander to handle (break bread and butter the same) by reaching to the left (rather than the right)?